The saying goes that neither time nor distance can stop two lovers from meeting. 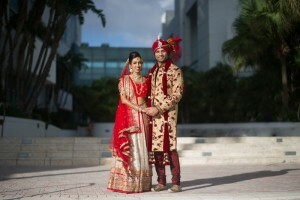 For 28-year-old Ami Vakharia and 29-year-old Raj Gandolia, both radiology physicians, their love story began during their teenage years when they met in the Tibetan Himalayas. Though years passed before the two reconnected on Facebook, after two and half years of dating, Raj enacted the perfect proposal from via their romance timeline photo frames. He prepared for the big day for six months. Naturally Ami was on seventh heaven. After all, she had booked the wedding venue in Florida shortly before the proposal. Guess the heart instinctively knew and wanted things to be perfect! Raised in Florida, she selected the venue as it had stolen her heart at first look with its modern look and romantic beach in the backyard. Planning the wedding in Florida from North Carolina was difficult despite help from her mother and Eventrics Wedding Planning. 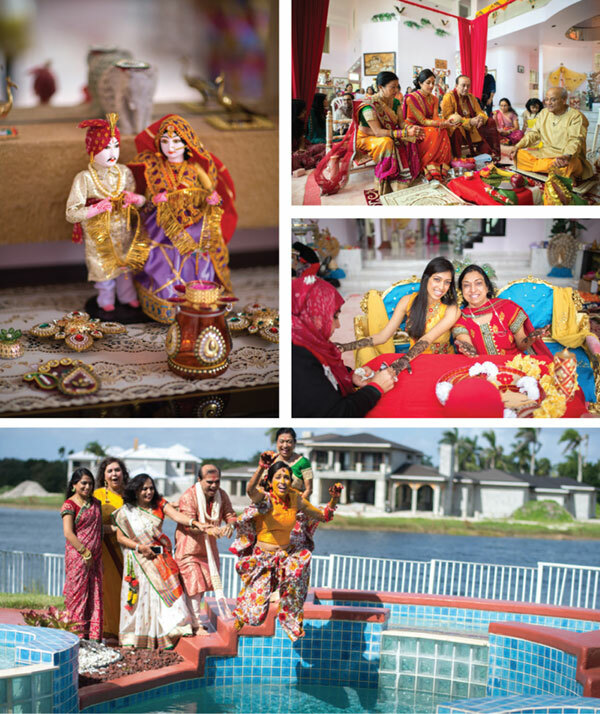 The pre-wedding ceremony was a festive fanfare of a Rajasthani mela. 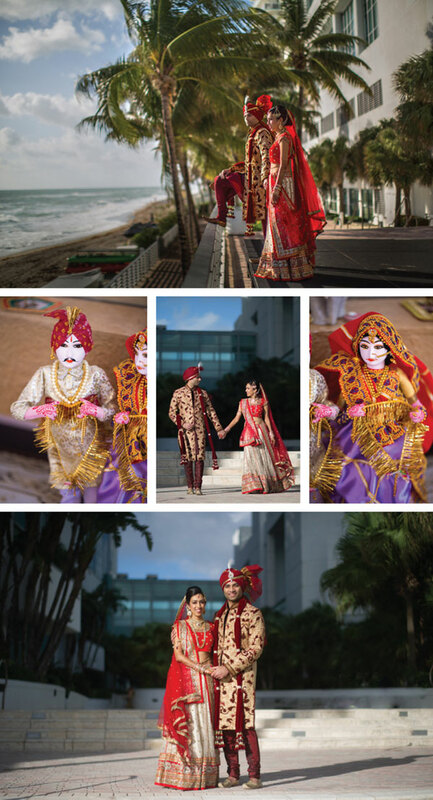 Amidst the absolute riot of vibrant colors and fun overflowing, the height of romance was reached with a Swayamvar executed in a specially set up royal palace. About 450 guests cheered the princess selecting her prince charming. For the ceremony, the ballroom selected was inherently romantic with its one wall composed of all windows and peeking into the ocean. The ceremony program was beautifully decorated in a fan shape and placed on each of the chair for all 300 guests. The ceremony, like their romance had its own jittery and happy moments. Ami had planned the wedding to be in the open amidst the ocean, but the extra windy atmosphere played on their nerves and finally at midnight, Ami had to decide on conducting the ceremony indoors. However, all the confusions and frantic worries were forgotten the minute Ami walked down the aisle at 10 am amidst the background music by the DJ Dynasty or Ravi Prasad. 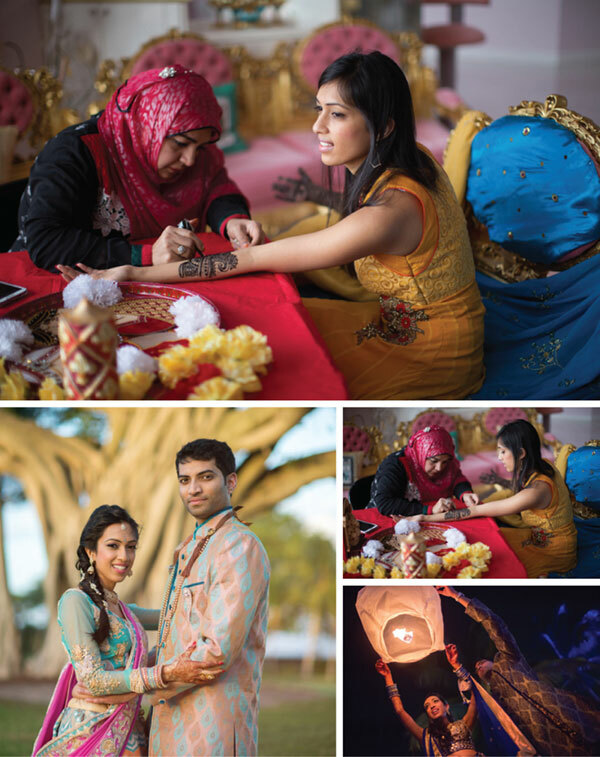 The couple took their vows completely lost in one another as two soul-mates are meant. The reception was attended by about 480 guests. 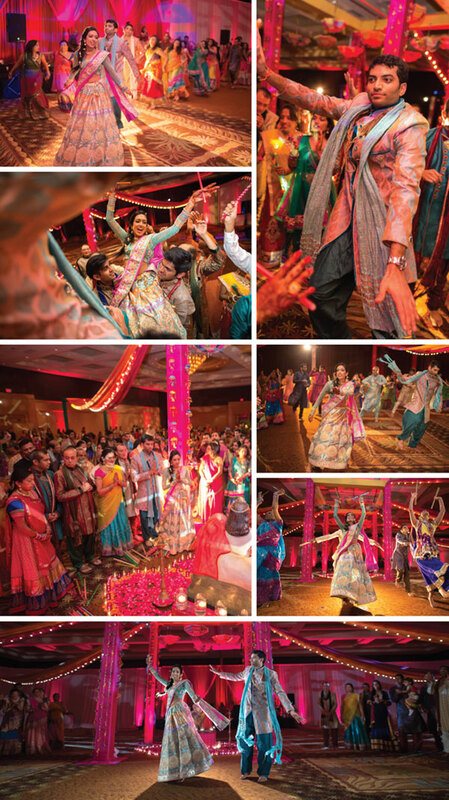 Unlike other wedding receptions, Ami and Raj’s was unique. An animated cartoon story about their first meeting to their trip to the altar was created by the wedding planning company and shown to guests. The couple themselves took a trip down nostalgia lane and were quite moved. With the bond further strengthened, they were lost in each other while the guests danced the night away, celebrating their union. Ami happily reminisces about her wedding and fondly advises all at the end of the day nobody remembers the details the couple put into decorating the wedding venue. However, guests talk about the food for a long time, so it should be lip-smacking good – just as the the ethereal romance between the bride and groom!